Nicola grew up on a small farm in County Fermanagh where she developed a love for nature and making things. She learned to weave at the National College of Art and Design, Dublin, and was instantly intrigued by the infinite design possibilities and mechanical making process. 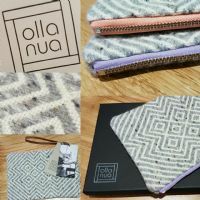 The name ‘Olla Nua’ comes from the Irish words for 'new wool' - a natural, sustainable material, which Nicola uses in a modern, imaginative way.